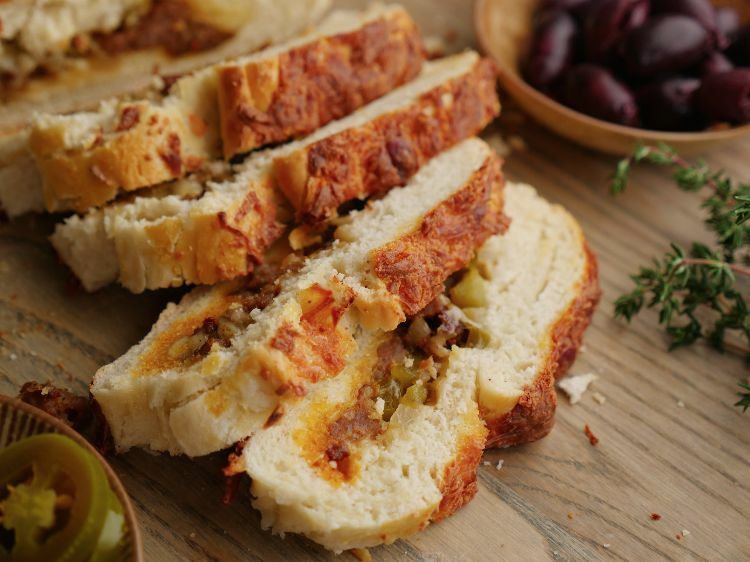 When I was growing up, my brother could only cook one thing: cheese bread. It was as simple as it sounds; he just placed slices of cheese on top of slices of bread and melted them in the toaster oven until they just started to burn. Although I’ll never understand his predilection for foods that taste burnt, I do understand the appeal of a cheesy bread. It’s almost universal. But why not up the ante with some Cajun seasoning and sausage? I promise it’s still easy enough that even my brother could make it. This version is rolled up, with the sausage and cheese inside (plus a little on top for good measure). If you don’t feel like making your own dough, you can use pre-made pizza dough instead; nobody will rat you out. In a bowl or large Pyrex measuring cup, whisk together the water and sugar. Sprinkle in the yeast and set aside for about 10 minutes (it should be foamy). Add 3 tablespoons of the oil. In a large bowl combine the flour and salt. Make a well in the center of the flour and pout in the yeast mixture. Stir together the wet and dry ingredients with a wooden spoon or a spatula until a rough dough forms. Pour the final tablespoon of vegetable oil into a clean bowl and turn the dough around in it until all sides are covered. Place a dish towel over the bowl and allow the dough to rest in a warm, dry place for one hour. While the dough is resting, place a medium pan over a medium high heat and add the sausage, Cajun spice and paprika. Cook until browned all over, about 5 minutes. Place the sausage on a plate lined with paper towel and put the pan back on the heat. Add the onion and green bell pepper and sauté until they just begin to soften. Set them aside with the sausage. Once the dough has risen, take it out and cut it into two pieces. 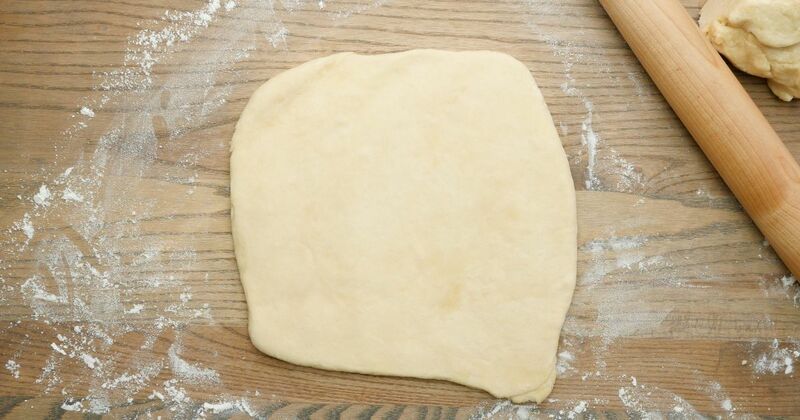 Roll each one out into a rectangle shape on a lightly floured surface with a rolling pin until it is approximately one-fourth-inch thick all over. Add half of the meat and vegetables across the length of the dough in the center, leaving an inch border at both ends. Top with half of the shredded cheese (reserving two tablespoons). Wrap the sides of the dough across the center and use a little bit of water to seal where the edges of the dough meet. Pinch the ends closed and place the roll on the prepared baking sheet. Repeat with the second piece of dough and remaining fillings. Brush each roll with the beaten egg and sprinkle with the reserved mozzarella cheese. Bake for 30 to 45 minutes, checking every so often. Allow the rolls to cool for at least 10 minutes before slicing and serving.